Last summer, while I was in New York researching and studying Yiddish, I decided to check out the cultural offerings of Hasidic Williamsburg. The highlight of this jaunt into the living world of Yiddish was a trip to a bookstore on Lee Street, the neighborhood’s main artery. Not surprisingly, there was an impressive, if daunting, array of leather-bound holy books lining the walls of this crowded little store. But the store also carried material for children, including a Yiddish version of Monopoly. Even more unusual was the selection of refrigerator magnets, including ones featuring the stern face of a rabbi with a mystical inscription which, if used properly, promised to repel mice and rats. Perhaps my most exciting discovery was a simple, hard bound book entitled Himmel Signaln (Sky Signs), a Hasidic response to the events of September 11, 2001. 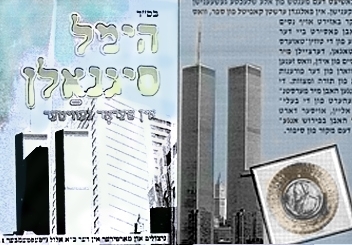 The book’s cover illustration is a low-resolution, poorly Photoshopped depiction of the World Trade Center devastation on 9/11, or, as the book would have it, the devastation of “21 Elul.” Indeed, the subtitle of the book reads: The Survivors and Martyrs of the 21 Elul (“September 11”) Tragedy. September 11 is set off by quotation marks, making it clear which reckoning of time is legitimate. The writer and publisher of the book is a rather mysterious entity designated as “Yud Yud Samech” (in Hebrew characters). Opening this book, one enters into something of an alternate reality. Before even reaching the table of contents, the reader is confronted by an advertisement for authentic “Rabbi Meir Baal Ha’Nes Pushkes” (tzedakah boxes). And yes, they accept Visa and MasterCard. Immediately following the ad page, there is a genuinely touching two-page acknowledgement of valued, righteous community members that perished in the attacks. Two victims are mentioned by name, with brief biographical sketches included. While Himmel Signaln contains a history of the Twin Towers and the Pentagon, the bulk of the text consists of personal accounts of various people who were miraculously saved from the 9/11 attacks. Each survivor story reads like a mayseh (a fantastic tale usually imparting some moral or educational function). The stories often begin, “Mr. So-and-So, a ba’al torah and mitzvos [a phrase that suggests the person is a religiously observant Jew] from New Jersey…” and then proceeds to explain the miracle of his survival on 9/11. Oftentimes, the reason for the survivor’s absence from the WTC towers involved the performance of some mitzvah. A typical narrative is one called “Eyshis Hayil” (meaning a “Woman of Valor,” which is the title of a passage from the book of Proverbs traditionally sung to one’s wife on Friday night). This tale is about a gentleman from New Jersey, who is, not shockingly, a ba’al torah and mitzvos. During this time of the year, the aforementioned month of Elul, the gentleman awoke each day at 5:30 am to recite the pre-Rosh Hashanah Selihos prayers. He would then drive his children to school and take the train to work in Manhattan. On the eve of 9/11, our hero was about to set the alarm clock for 5:30am, when his wife encouraged him to set it a half-hour later so that she could drive the kinderlakh to school. As a result of this providential interception, our protagonist arrived in Manhattan just late enough to miss the horrific events that occurred at the World Trade Center where he worked. The story wraps with a quotation emphasizing that it is the woman’s responsibility to bring the children to heder (school). A literal translation of this gem of rabbinic wisdom seems to imply that bringing children to heder is the singular z’khus (merit) of women. In another section, entitled Gam Zu L’toivoh (in Yiddish, Alles Iz Tzum Gutn, or in English, “This Too is For the Best”), we learn of the sad, but in retrospect, providential injury of the son of another baal torah and mitzvos from New Jersey. This second devout New Jerseyite was an employee of Morgan Stanley who worked on the 67th floor of one of the towers. On the morning of 9/11, this man would have been in his office at the time of the tragic attack, but fate interceded. His young son, who had broken his leg at summer camp, needed to be brought to the doctor on that very morning. Unlike the case of the woman, there is no pious pronouncement here that it is the z’khus of a man to bring his children to the doctor. Anyone who was supposed to be in the Twin Towers that day and didn’t go (because of hashgocho protis, or divine providence), should send the publisher their stories so they can be made known in later projects, be’ezras hashem [with the help of God] in the near future. Only signed submissions with names, a telephone number, and a mailing address will be accepted. Yasher Koach. The book expresses the very real concerns and priorities of certain segments of the Hasidic community in New York. In a startling diversion from the typical Hasidic take on American society, the book’s foreword contains a proclamation of solidarity with the American people, specifically, the people of New York and Washington, D.C., in the face of these tragedies. The manner of writing suggests that this book is targeting a wide audience within the ultra-orthodox world of Hasidim, hoping to teach the young while also inspiring the working parents (or, in this case, fathers), who might have themselves experienced events such as those described in the various narratives. What is perhaps most fascinating about Himmel Signaln is its insistence on the notion of Divine Providence–those who were saved were saved by the grace of God–while at the same time remaining aware of the cruel and often random nature of fate. This strange, yet familiar, duality is prominent in historic Jewish consciousness. We traditionally think of ourselves as The Chosen People, the “apple of the Almighty’s eye,” and yet our history is one of repeated trial and tribulation…and survival. Note: Translations of Yiddish were done by the author. The author would like to acknowlege gratefully the YIVO summer institute at NYU for their generous assistance last summer during her Yiddish research in New York. Yiddish originated in Germany, but was eventually spoken by Jews all over Europe.